Boston, Nov. 9, 2016, — World and local leaders have released statements on Donald Trump’s historical victory in yesterday’s US Presidential Election. Trump won at 278 electoral votes as of this morning, and became President-elect of the US. Gov. Baker also released a statement today expressing willingness to partner with Trump administration. 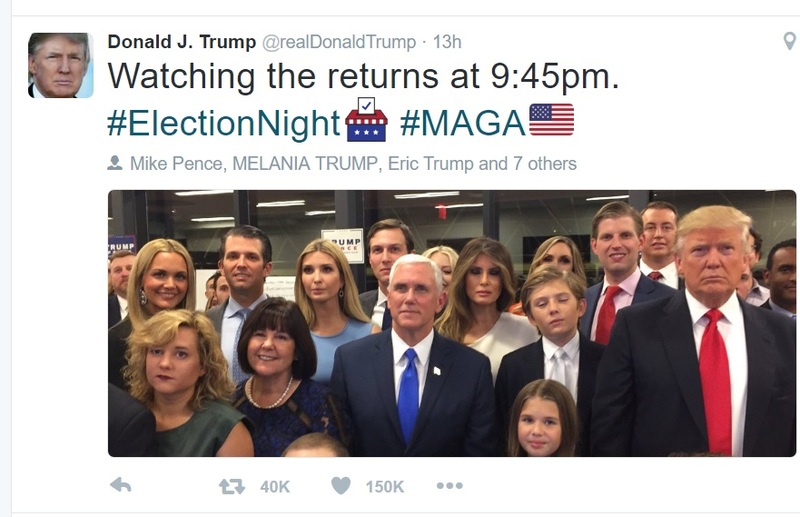 Trump tweeted this picture on election night. Chinese President Xi Jinping congratulated Donald Trump in a telegram, CCTV reported. Earlier the foreign ministry said that China was hoping to work with the new US government to boost bilateral relations. “US China trade relations are mutually beneficial. Two mature big powers like the US and China will handle things well,” foreign ministry spokesman Lu Kang said. German Chancellor Angela Merkel has congratulated Donald Trump on his win in the US presidential election, before underlining the importance of their countries’ relationship and reminding the president-elect of their shared values. “Whoever the American people elect as their president in free and fair elections, that has a significance far beyond the USA,” the chancellor said in Berlin on Wednesday. President Vladimir Putin has said he is willing fully to restore ties with the US following Mr Trump’s victory. “We heard the campaign statements of the future US presidential candidate about the restoration of relations between Russia and the United States,” Mr Putin said on Wednesday. “It is not an easy path, but we are ready to do our part and do everything to return Russian and American relations to a stable path of development. In Moscow meanwhile senior nationalist MP Vladimir Zhirinovsky threw a party at the parliament building to celebrate Mr Trump’s win. Former Soviet Mikhail Gorbachev has also welcomed his triumph. Relations between the US and Russia have become more tense because of the conflicts in Ukraine and Syria and allegations of Russian cyber attacks in the US during the presidential campaign. President Hassan Rouhani said the result would not have any impact on Iran’s policies. He was quoted by state media as saying the election result reflected internal discontent and instability within the US which would take a long time to be solved. Speaking in relation to the Iran nuclear deal, President Rouhani asserted that it was a clever move by the Iranian government to establish it as a UN Security Council resolution rather than a deal with a single government. President Ashraf Ghani said that his country and the US are “strategic partners in the fight against terrorism and partners in development”. “Afghan government is hopeful that close co-operation with the new president-elect will further deepen ties between the two countries,” a statement released by the presidential palace said. Chief Executive Abdullah Abdullah added that “combating extremism and efforts to bring peace and stability” are the top priorities of both countries, along with strengthening economic, military, social and cultural ties. Prime Minister Justin Trudeau says that “Canada has no closer friend, partner and ally than the United States”. “We look forward to working very closely with President-elect Trump, his administration, and with the United States Congress in the years ahead, including on issues such as trade, investment, and international peace and security,” he says.